Osteoporosis is a condition wherein gradual loss of calcium causes the bones to become thin, fragile and more likely to break. It mostly affects women after menopause, but could also affect men. It is estimated that 36 million Indians are suffering from osteoporosis. One of the best ways to detect your risk of osteoporosis is to go for regular bone density tests and scans. We, at Apollo Clinic, constantly stress on the role of preventive tests and check-ups to ensure that your bone health is optimum. What is a DEXA scan used for? DEXA (Dual-energy X-ray Absorptiometry) is an improved form of x-ray technology that helps in the accurate detection of osteoporosis. It can also be used to assess your risk for developing fractures. Today, DEXA bone densitometry is the established standard to measure bone mineral density (BMD). DEXA is generally used to measure the hips and lower spine, but can also be used for screening the wrist, heel or fingers. In certain cases, the whole body DEXA scan may also be suggested. Who should get a DEXA? DEXA is a quick and painless procedure. Depending on the equipment being used and the parts of the body examined, the scan takes 10-30 minutes. You may be asked to put on a hospital gown. Next, you'll be asked to lie down on a padded table with an x-ray generator below an imaging device (detector) above. DEXA is most often performed on the lower spine and hips. During your spine examination, your legs will be supported on a padded box to flatten your pelvis and lumbar (lower) spine. In case of a hip examination, your foot will be placed in a brace that helps rotate the hip inward. The detector is then slowly passed over the body area, generating images on a computer. 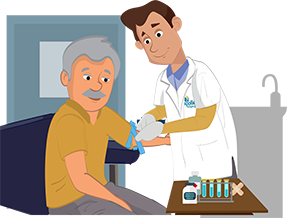 In case of a pDEXA (Peripheral DEXA), you will be asked to place your forearm, hand, finger or foot in a small device and the reading is obtained in a few minutes. How can I prepare for a DEXA examination? Basic preparation is required before going for a DEXA bone density scan. At Apollo Clinic, we have cutting edge DEXA equipment including central and peripheral devices to measure BMD. We follow rigorous procedures and have the most competent physicians, x-ray technicians, radiologists, nurses and support staff ensure that each DEXA scan investigation and result is precise. We also have the requisite skill and experience to perform Lateral Vertebral Assessment (LVA) to screen for vertebral fractures.